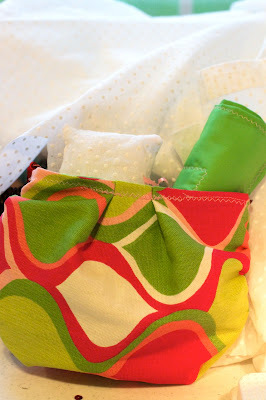 I got the idea for this purse/diaper bag from my friend who made an adorable purse for Johanna with gathered sides. This purse can be used for a child's dress up, as a baby doll's diaper bag, or make one for yourself for a night out on the town. Just make it bigger! 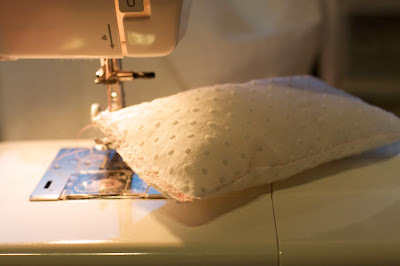 Start by cutting the fabric roughly an inch wider then the size purse you're wanting in the end: two pieces for the exterior (like a home decor or sturdier fabric) and two pieces for the lining. I cut the pieces all like the letter "D" turned on its side; straight for the top, or opening of the bag, and a half circle for the purse itself. 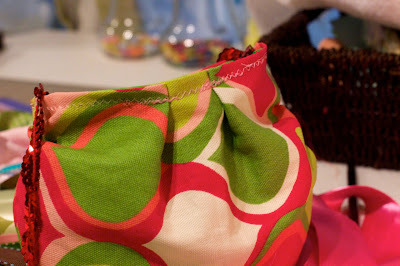 Start with the exterior fabric pieces and pin them together. 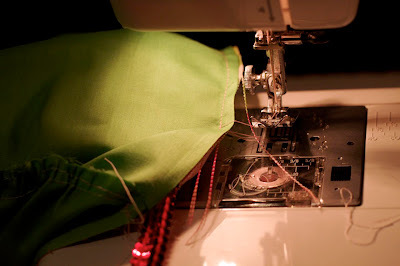 Put your machine's dial for length of fabric on 4 to baste to make the gathers. 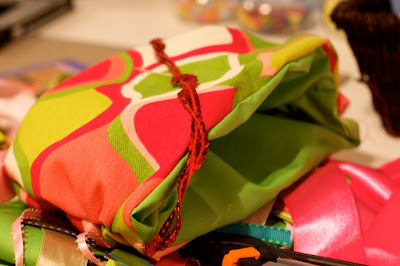 Simply start sewing from the straight line of the top down one side of the bag, following the curse of the bag, all the way to the other side, about 1/2 an inch from the edge. 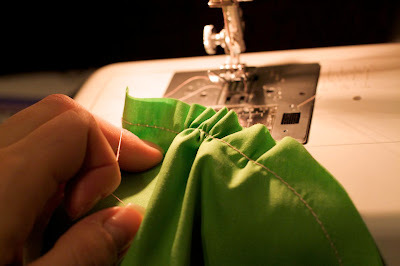 DO not back stitch the beginning of the seam or the end. The fun part: as seen above, pull on one of the pieces of thread from either end and watch a small gather appear! 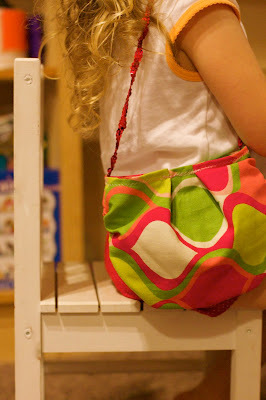 Keep adjusting the gather down the purse and on both sides until you're satisfied. Now you need to sew that gather in place. 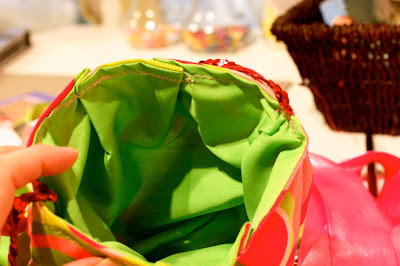 Sew a seam, after adjusting the length of your thread to about 2.5 again, and sew close to the gathered seam all around the curved part of the purse. Trim excess. Voila! the gathered sides! 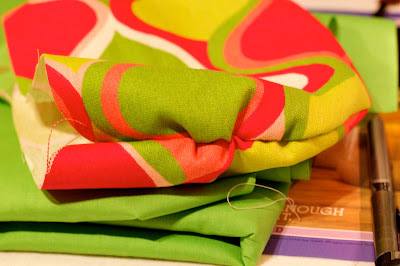 Do the exact same process to the lining fabric. 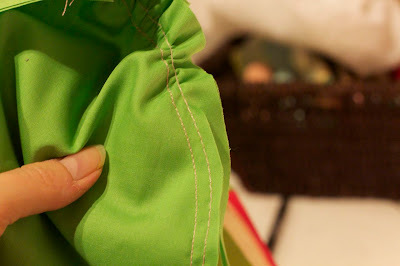 Place the right side of the lining inside the exterior's pocket you've just sewn (right side of exterior fabric should be inside the pocket). 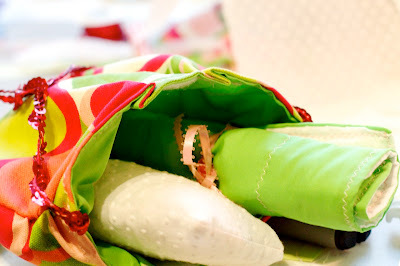 Now pin your ribbon, row of sequins, or whatever you care to use as the strap, to the two ends of the bag, the ribbon being between the lining and exterior pieces. Make sure at least an inch will be sewn into the seam for security. Sew at 5/8" all the way around the straight top of the purse, connecting the exterior and lining. 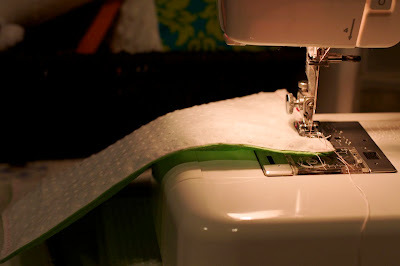 Leave a two inch unsewn section at the top to pull the right sides of both fabrics through. Take the two inch opening on the top and pin it inwards for now. You should have a mostly complete bag now. Here is simple baby doll blankie. 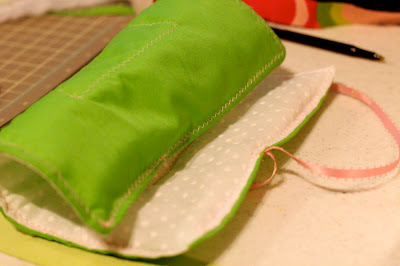 I stacked a rectangle piece of white textured fabric onto green fabric onto a piece of quilting batting. Sew around the border leaving a two inch gap. Snip corners and bulky salvage. 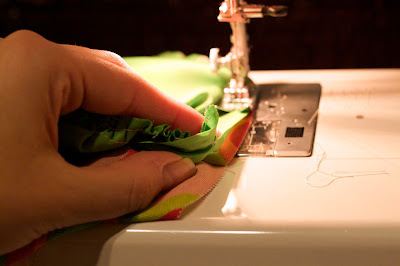 Pull the blanket through the gap and finish off the edges with a zig zag stitch. 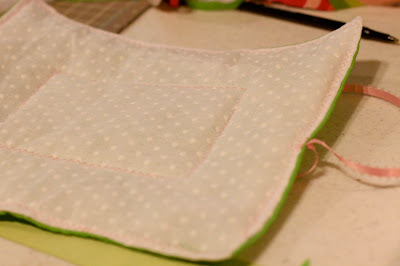 Sew a small rectangle in the middle to keep the blankie from bulking if washed. 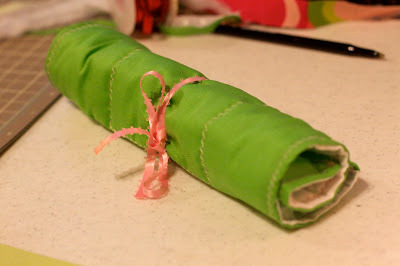 Sew a coordinating ribbon on one of the short ends of the blankie, in half. This is used to roll it up. That leaves a small pillow. 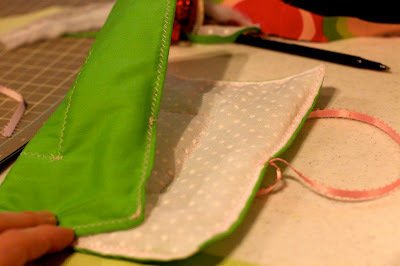 Same idea: sew two small rectangles together, leaving a two inch gap to pull the pillow back through. 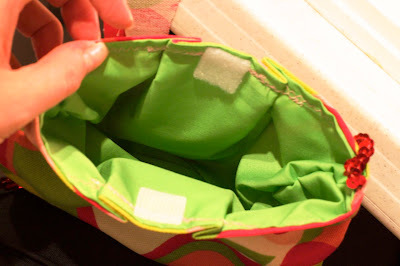 Fill with microfill, pin the opening closed inward, and sew a finishing seam, zig zag if you'd like, just at the one end. And there you have it. A posh purse of sorts.